The Garon family have one of the longer histories in the Northern Rhone Valley that dates all the way back to 1475, starting with Guillaume Garon. However, the modern era for Domaine Garon begins in 1995, when they began to bottle and sell their own wine. Some things are well worth waiting for. And in this case, there was quite a wait as Domaine Garon has owned those vines since 1836! The Garon family began planting the vineyards in 1982. At the time, the land had gone fallow, so it was quite an undertaking, as the vineyard had to be planted from scratch. Once the vines were able to produce, the initial harvests were sold to Guigal. Today, Domaine Garon bottles more than 90% of their harvest, the remaining grapes are sold to Guigal. Small amounts of wine were made in 1992. They truly began producing a fair amount of wine by 1995. The wine was sold as Domaine Garon Cote Rotie, which changed names a decade later to les Triotes, just in time for the 2005 vintage. Domaine Garon added to their portfolio with the les Rochains in 2003. 2003 was a growth year for many reasons for Domaine Garon as that marked the vintage when the sons of Jean Francois Garon, Kevin and Fabian Garon joined the team. 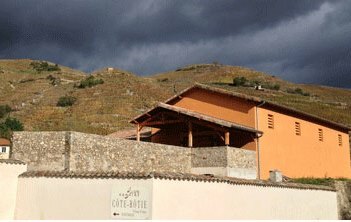 Domaine Garon added another Cote Rotie to their expanding holdings when they introduced Garon la Sybarine with the 2009 vintage. Domaine Garon owns 5 hectares of vines in Cote Rotie. The vineyards are divided with some parcels on the Cote Blonde and other vines being planted on the Cote Blonde. Their vines are planted to 100% Syrah in the Rochains, Triotes, Lancement, Combard and Mollard lieux-dits. Domaine Garon is a traditional Cote Rotie producer. The grapes are crushed in whole bunches. The amount of destemming varies, depending on the vintage and the vineyard. Vinification takes place in stainless steel tanks.The wines are aged in an average of 30% new, French oak barrels and the remainder is aged in 5 year old barrels for between 18 to 24 months. But this can vary widely, depending on the wine and the vintage. Domaine Garon produces 4 wines in Cote Rotie and a Vin de Pays Syrah. Domaine Garon Lancement is produced from 100% Syrah planted in the Lancement lieu-dit, which is on the Cote Blonde. The grapes are partially destemmed, but a good portion of the grapes can also be whole cluster fermented. The wine is aged in an average of 50% new, French oak barrels for up to 36 months before bottling. Domaine Garon les Triotes is made from 100% Syrah planted in the Cote Blonde. Most of the grapes are destemmed. The fruit comes from vines planted in the les Combard, Lancement and les Triotes lieux-dits. The wine is aged for between 18 and 20 months in about 25% new, French oak barrels before bottling. Domaine Garon les Rochains is produced from 100% Syrah planted on the Cote Brune, from parcels that are located not far from La Landonne. The terroir is mostly schist and clay with deposits of iron in the soils. 80% of the grapes are destemmed on average. The wine made its debut with the 2003 vintage. Domaine Garon les Rochains is aged in about 30% new, French oak barrels for 18 months before bottling. Domaine Garon La Sybarine is made from 100% Syrah that is planted on the Cote Blonde in the Le Goutay and Le Mollard lieux-dits. On average 90% of the grapes are destemmed, before the wine is aged in used French oak barrels for 13-15 months before bottling. The wine made its debut with the 2009 vintage. Domaine Garon, when young, should be decanted at least 1-2 hours, give or take, allowing the wines to soften and open their perfume. Older vintages might need very little decanting, just enough to remove the sediment. Domaine Garon is usually better with 6-8 years of cellaring and should be at its best between 9-20 years of age. Domaine Garon is best served at 15.5 degrees Celsius, 60 degrees Fahrenheit. The cool, almost cellar temperature gives the wine more freshness and lift. Domaine Garon is best served with all types of classic meat dishes, veal, pork, beef, lamb, duck, game, roast chicken, roasted, braised and grilled dishes. Domaine Garon is also good with Asian dishes, hearty fish courses like tuna, mushrooms and pasta. Medium bodied, fresh, bright and crisp, but not overly so. The tannins are soft and polished. The wet , forest leaf, thyme and spicy kirsch notes remain from start to finish. Far too young, but that did not stop all the spicy, meaty, peppery kirsch from shining through. With freshness and vibrant red pit fruit from start to finish, another 5 years of bottle age will add a lot to this wine. Elegant, sensual, ripe, sweet, fresh and earthy, this feels great on your palate. Refined, bright and getting close to ready, the finish is all about the sweet red fruits, thyme and silky textures. Fresh, bright, sweet kirsch, black raspberries and earthy notes lead to an open, soft, vibrant, Cote Rotie with a lot of charm.